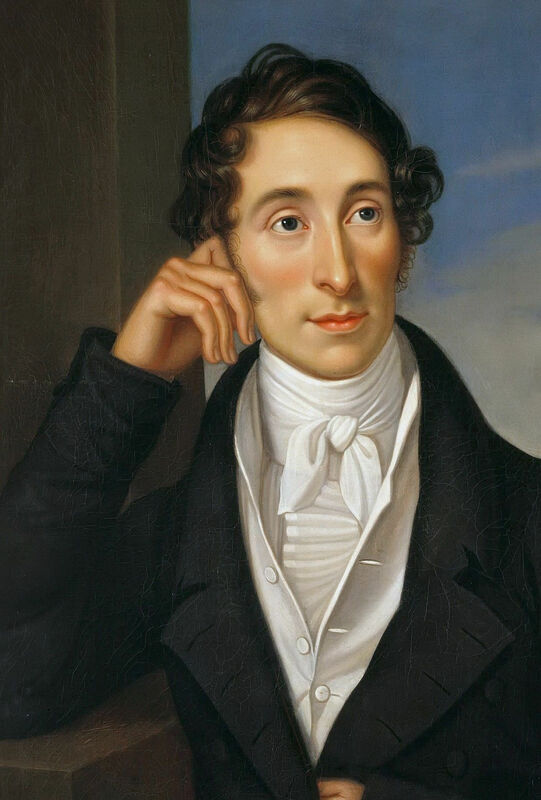 Carl Maria von Weber is widely regarded as one of the founding fathers of German romantic music. Although now primarily remembered for his development of romantic opera, he was also a prolific composer for the concert hall, writing major concertos for bassoon, clarinet and horn, each skillfully exploiting the full potential of the instruments. Although single reed instruments were known throughout the medieval and baroque periods of European music, the clarinet in its modern form did not evolve until the second half of the eighteenth century. By Mozart's time it had eight finger holes and five keys which enabled the player to play chromatic scales with good intonation and consistent tone. With the success of Mozart's Paris and Haffner symphonies it soon became an established member of the symphony orchestra. Weber came to know the clarinet through the playing of Heinrich Baermann (1784-1847) and admired his evenness of tone from the top to the bottom of the instrument. The two musicians worked together, going on tours through Austria and Germany. Weber wrote a concertino for Baermann early in 1811, for a performance in Munich which was attended by King Maximillian I of Bavaria. The King was so impressed that he immediately commissioned Weber to write his two clarinet concertos. The first was completed in one month, and performed shortly after. The concerto is in a conventional three movement form. The first is a dramatic stormy piece with furious orchestral tuttis contrasted with more reflective passages for the solo clarinet, and combined passages where the soloist plays brilliant virtuosic material above secondary themes in the orchestra. The movement ends quietly and mysteriously. The second movement is a complete contrast. It is an adagio with a beautiful gently lyrical melody played by the soloist over a simple orchestral accompaniment. A more dramatic central section disturbs the mood of tranquillity, but only for a short while. It is followed by a passage of remarkable beauty for the soloist and horns. The first idea is restated before the soloist and horns bring the movement to a gentle close. The final movement is a lively rondo with plenty of virtuosic work for the soloist. The episodes provide interesting contrasts. The first is in a minor key slightly recalling the turbulent first movement. The second contains a delightful exchange between the oboe and the soloist. The work concludes in a lively optimistic mood. Weber's first clarinet concerto was performed by the Portobello Orchestra on the 24th March 2018. The soloist was Lucinda Dunne and the orchestra was conducted by Sam Jones.